A classic dish that I found at A Taste of Spain: 9 Classic to Make at Home from The Kitchen . In the 9 Classic dishes I chose Steamed Clams in Wine and Chorizo (recipe originated from Epicurious) . The name Chorizo is new to me and later I found out that Chorizo is a sausage that has many different varieties and it is consumed all over Spain made with pork meat, parika and garlic. I also checked on line whether Chorizo is available at local supermarket but I only found Chorizo available at The Butcher and German Market Place. So I quickly get Chorizo from The Butcher and bought a bottle of Dry white wine and other ingredients from Cold Storage. Before starting, I soaked the clams in salty water for about 30 mins and rinse with water 2-3 times to wash away the dirt and sand. I even pan fried the Chorizo first before putting into the deep pot. My verdict: A pleasant classic dish that I’ll definitely cook again. Cook onion, bell pepper, garlic, cumin seeds and salt in oil in a deep pot over moderate heat, stirring occasionally, until vegetables are softened, 7 to 9 mins. Stir in Wine and bring to boil. Season with pepper and stir in cilantro. Serve these clams with some crusty bread for sopping up the sauce. Congrats Ann. This dish looks absolutely appertizing. Congratz and no doubt this dish is a winner. There is a typo, you've given cumin seeds as cumid seeds in the ingredient list. I've voted for you. Good luck! Hi Ann, Congratulations that you made it to round #2. I'm sorry that it's just this time that I got the chance to do my food blog reading. I love this dish, this is one of my favorites. Great job on the presentation. And of course you have my vote. Have a great week Ann. Best of luck Anncoo. You got my vote! Great post! The clams looks SO good. I voted for you! just voted for you. The pictures ara amazing. Good job. Wow would never have thought to cook chorizo with clam. Great job! Gorgeous and sounds very simple! Congrats! Must be so tasty with the chorizo! Anncoo, voted for u. All the best! I love all the colors in your dish. You have my vote. Sounds amazing, I love chorizo! voted for you! Great job ann! Will definitely be voting for this today! Lequan ~ Thank you! I think you can use any type of sausage besides chorizo. How about adding some squid or shrimp in it?.. Satya ~ Thanks for you support. Lyndsey ~ We can get different kind of fresh sausage from the German Market place too! Russell ~ Thank you for your compliment. Congrats Ann!! Will support you through and through! Lovely dish…. Can imagine the "sweetness" of the sauce from the clams…mmmm! wow, thats looks nice, and congrats on going on 2nd round. Congrats on getting into Round 2. 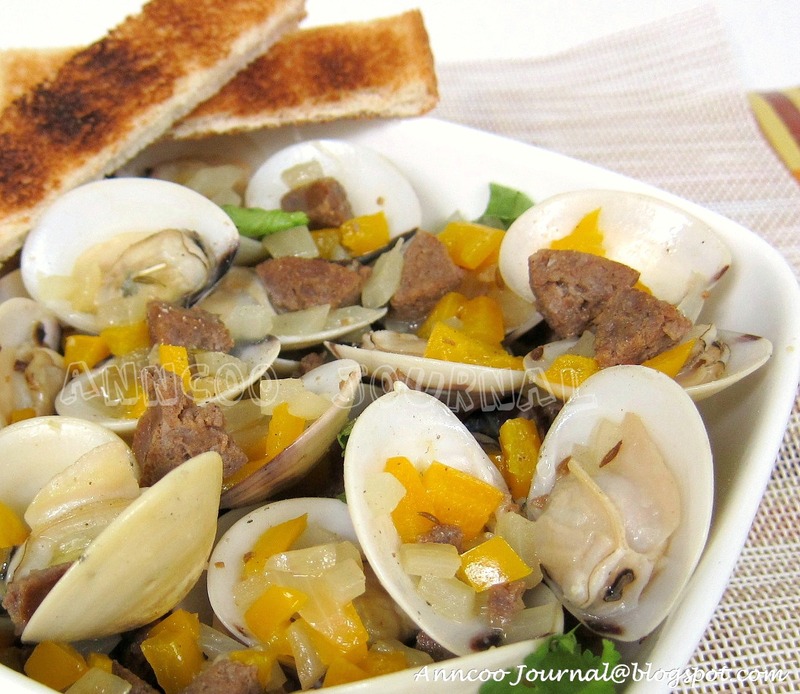 Love this easy clam dish….I will try it the next time I buy clams. Congrats on making Round 2! This looks like a really delicious dish! I love clams cooked in any way! I like yours! Congrats! Backing you all the way! Congrats on making it throught the 1st round. This dish sounds really tasty. All the best for round 2.
congrats, Ann and good luck on the next round. The clam looks fabulous. Will vote for you for sure. Ganbatte! This dish looks absolutely scrumptious! I'm going to have to give it a try. Good luck! I would love to make that dish Yum! This is so fresh and colorful!!! I wold love to have some of this. congrats dear …i am very happy for u …this dish looks so colorful n inviting ..yummy..
Goodie..goodie.. this sounds wonderful! Simple & delicious. I'm going over to make the vote now. Good luck! Congrats on making it to the next round Ann! I love clams! You've done a great job with this dish. It's beautifully presented, and I can tell that your clams are not overcooked. I've never heard of chorizo with clams before, so this is quite an interesting combo to me. My hubby loves his meats so I bet he would love to try this meat and seafood combo. Best of luck in the challenge! Congrats Ann, I am so so happy and excited for you, will definitely vote for you again! 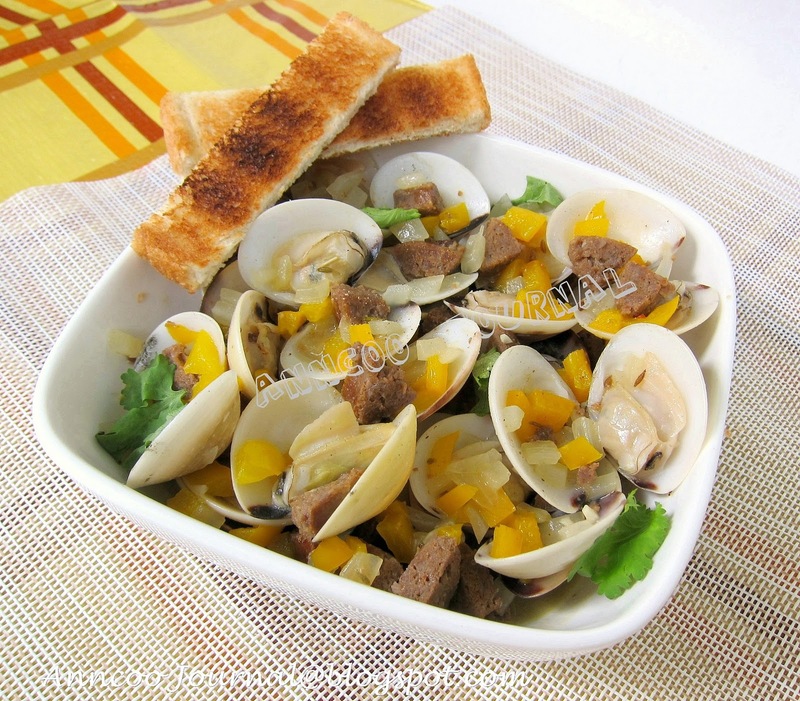 This is the dish that love by my husband, too bad I dun take clam :p. Ann all the best!